Only one season ago, no one doubted that Evgenia Medvedeva would be the triumphant of the Olympic Games in Pyeongchang. 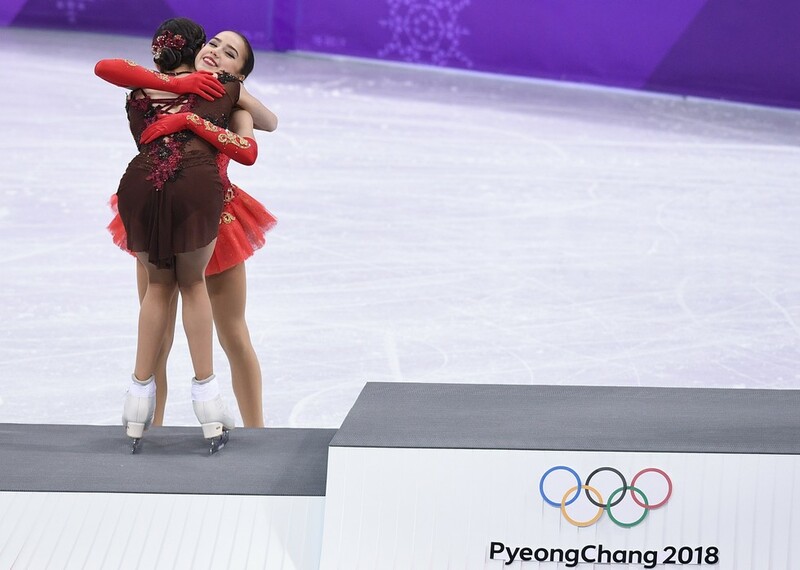 The light and feminine figure skater does not get tired of taking a medal for a medal, breaking the record for a record ... Many have already got used to the fact that Evgenia Medvedeva on the ice is invincible. But the situation changed when her friend appeared and, like her, the Eteri Tutberidze's student - Alina Zagitova. The 15-year-old girl instantly conquered all her non-childish confidence and sharpened technique. And so at the wrong time, Medvedeva was injured, conceding several starts this season. All this prevented her from realizing her cherished dream. Zhenya at the Olympics in Pyeongchang was only the second. And this is definitely not the case when silver is more expensive than gold. - I'm not surprised. Every day I see how Zagitova works, she showed her best skating, - Zhenya confessed. Evgenia Medvedeva was born in Moscow in a Russian-Armenian family. Her mother is Zhanna Devyatova, and her father is Arman Babasyan. Surname Zhenya got from her grandmother on her mother's line. But, despite this, in the Armenian media she is often called by the surname of the father. Figure skating came into her life as love at first sight. She, together with her mother, attended the competitions at the Moscow Palace of Sports. Then the little Zhenya said: "I want the same, I'm alone, all in sparkles and a ray on me . " And since Zhenya's Mom is a former figure skater, it was decided to put her daughter on skates. Moreover, doctors strongly advised to push the girl into sports because of poor health. So, at the age of three, mother brought Zhenya to the figure skating school of CSKA. True, at first they did not want to take her. She was too small. But after talking with the Head of the school, Medvedeva's parents managed to still insist on their own. Zhenya first trained with Coach Lyubov Yakovleva, and then - with Elena Selivanova. In 2007, she moved to the group of Eteri Tutberidze, and it was then that the star named Evgenia Medvedeva was lit. The Russian-Georgian coach was able to disclose it and show it to the whole world. At the age of 12 she was already a part of the Russian national team. She made her debut at the Grand Prix stage among juniors in Latvia and took first place at once. Tatiana Tarasova in one of her last interviews called Medvedeva an absolute human genius. And that's why. At the age of 18, she repeatedly forced the world to talk about herself. Firstly, Zhenya is the only skater who managed to win the junior world championship, and the next year - already an adult world championship. Secondly, Evgenia is the third Russian figure skater after Irina Slutskaya and Elizaveta Tuktamysheva, who won all the major competitions of the season (European Championship, World Championship and Grand Prix Final). And yet none of the Russians, except Medvedeva, could not win twice in a row in the World Cup. In addition to all this, she has 12 world records. Like many athletes, Zhenya lost her childhood. She did not even go to school often. She had to switch to individual training. Despite this, the girl without any problems gives an interview in English, likes to read books and loves Japan ... She likes culture, language, but especially cartoon anime. In particular, "Sailor Moon", in the image of which she was already on the ice. It's no wonder that in Japan they simply adore Medvedeva! She also likes Korea, where the Olympic Games are held. She is an ardent fan of pop group EHO and music direction K-Pop, which originated in South Korea. By the way, the athlete herself assures that she often listens to music before going out on the ice. Perhaps at the Olympics, she included local performers. The most terrible thing is what will happen next. After the triumph of Russian figure skaters Yulia Lipnitskaya and Adeline Sotnikova at the Sochi Olympics, the girls disappeared from sight ... Lipnitskaya already announced her retirement due to problems with anorexia. Sotnikova has not yet made official statements, but has not competed for a long time. We want Pyeongchang not to crush Evgenia Medvedeva and her rival Alina Zagitova. Girls are a real pride of Russia, they were able to cope with emotions and make their business flawless in difficult conditions and under great pressure. Thank them for that! This will never be forgotten. Well, we can only hope that the gold medal of the Games will still find Medvedeva. Even after four years. After all, she, like no other, deserves to wear the title of Olympic champion.